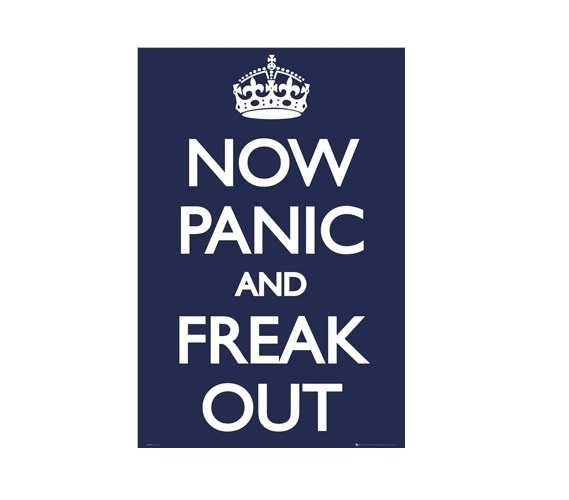 Every day you probably see a bunch of those "Keep Calm" signs and dorm room posters. Maybe you see them and want something a little different from those "Keep Calm" designs to add to your dorm room decor. Not only do you want something unique from those popular dorm essentials, you also want something that displays your sense of humor. Your college dorm room decor is important to making your college dorm room feel like home and believe it or not you can get all those features in one dorm wall art item! Look no further than our Panic- Freak Out College Poster! Our Panic- Freak Out Poster for Dorm Rooms is a cool college poster! This dorm essentials item has a simple design and will add plenty of style to your college dorm room decor. Of course, it's going to do more than add to your college wall decor, it's also going to show your sense of humor. This dorm necessities item features a funny saying that is the exact opposite of the "Keep Calm" signs and is also in a simple white and navy design. You're going to get some funny college supplies and some cool dorm room decorations in one dorm item with our Panic- Freak Out Dorm Room Poster in your dorm essentials!